Bulgaria, Germany and Andorra offer Europe's best-value skiing holiday. Bulgaria, Germany and Andorra offer best-value skiing in Europe, TripAdvisor announces. 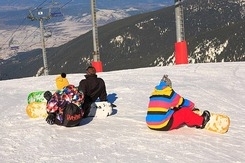 The web site compares prices in 34 popular European ski destinations. The estimation is based on the combined cost of one night’s hotel accommodation, one day’s ski pass, one day’s basic ski hire, a local meal and a bottle of beer. Topping the list for affordability is Bulgaria’s Bansko with a total cost of just Ј108, while Italy’s Mount Etna took second place with Ј117.73 and Germany’s Berchtesgaden took third with Ј150.31. Andorra and Germany lead the best-value list, with each country laying claim to three destinations in the top ten.